This is a busy time of year. One holiday after another arrives with foods to prepare and gifts to share. 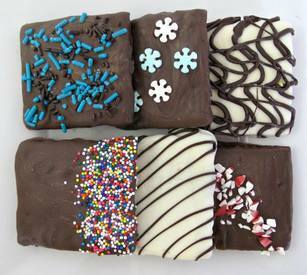 Chocolate Covered Graham Crackers look like a fancy gourmet treat but are easy to make and can be stored for weeks. Chocolate covered anything is recommended only for cold weather shipping. Due to my unfortunate ineptitude with tempering chocolate ( see my Mallomar post for evidence), I chose to use Ghirardelli melting wafers for the chocolate candy coating. Wilton also makes candy coating discs. Candy coating melts very smoothly and is supposed to set with a slight sheen if hardened in the refrigerator. I think the Ghirardelli tasted more like real chocolate but none of my dipped grahams came out shiny. One 12- ounce bag of melting wafers covered about 12 graham squares. If using additional melted wafers for decoration, you will need an additional bag.